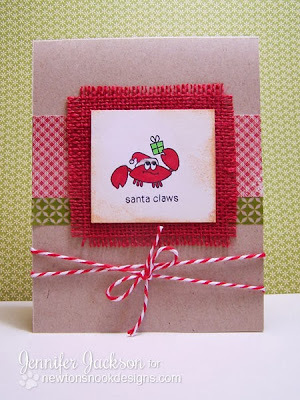 Newton's Nook Designs: Santa Claws + how to add fabric to your cards! Happy Wednesday! Is everyone ready for some turkey filled goodness tomorrow? I am! What are you going to do over the holiday weekend? I'm hoping to work on my Christmas cards! I know -- I've been posting lots of christmas cards but I want to come up with a simple design and make a BUNCH of them to send out for this year! Today I'm sharing two ways to use your fabric on your cards! The first one is this super fun Santa Claws card. 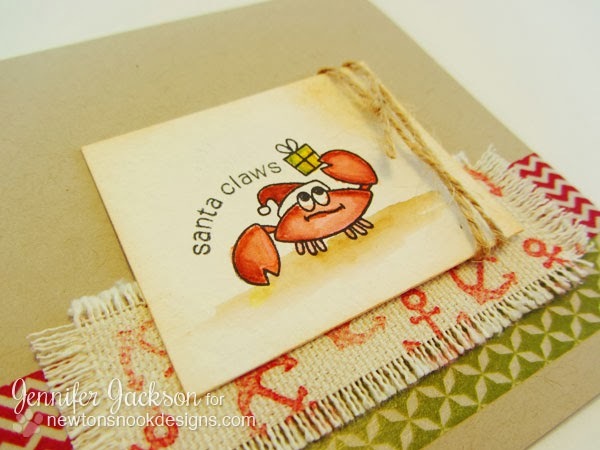 I stamped the little crabby dude from the SEAson's Greetings set on watercolor paper and colored him using Tim Holtz Distress markers! 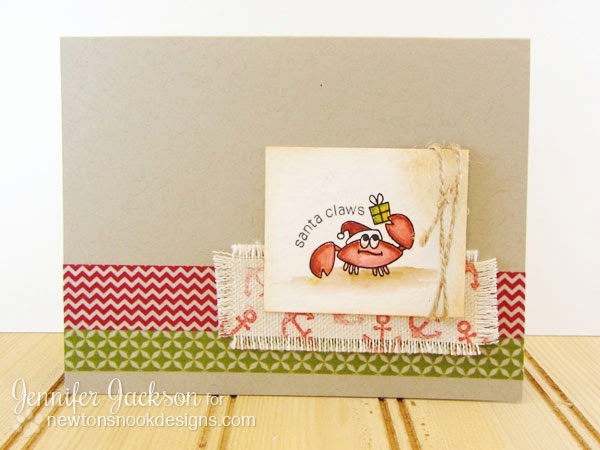 I curved the sentiment "santa claws" to fit around the crab! Isn't it fun how you can manipulate clear stamps like that? It adds so many options to the words! Then I took the anchor and stamped it on some canvas fabric with red ink -- I used Stampin Up ink but I think almost any would work. Isn't that a fun way to add some texture to your card? I frayed the edges a bit and attached it onto the card. Add some washi tape and.... done! For the second card I stamped the same crab with black ink and colored the image with copic markers. Then I distressed the edges with a sponge and some distress ink. I added some liquid "pearl" effects to his hat and then put some red burlap behind him! 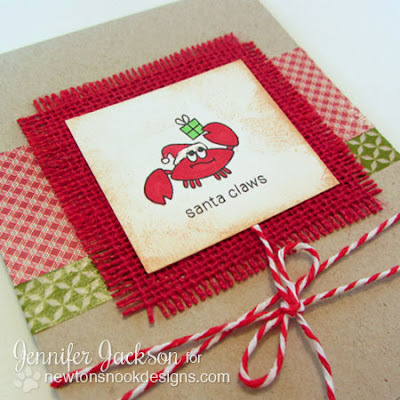 Burlap is also a really fun way to add some texture to your cards! It is a little messy to cut but it's so pretty, don't you think? To finish off the card I just added some patterned paper, washi tape and bakers twine! Holiday Kick-off Sale This Weekend! Make sure to check out Newton's Nook Designs online store over the weekend for some awesome deals - it's a great time to stock up for yourself and buy some holiday gifts too! Ooo fun! I haven't thought of using fabric on cards before :) have fun making holiday cards over the weekend!